Selecting the right PC case is a personal decision, so the options I recommend here may not be right for you. But you should keep a few key things in mind while you’re looking for a shell to house your PC’s innards. The first is layout: Having a lot of ports up front will make connecting devices such as USB thumb drives easy. Also consider size and weight--a smaller chassis will fit just about anywhere, and will be convenient should you need to move it to clean any accumulated dust. But a compact case could also limit your components options, and some CPU coolers and graphics cards simply won’t fit inside. For a budget PC, I recommend the Fractal Define R3. 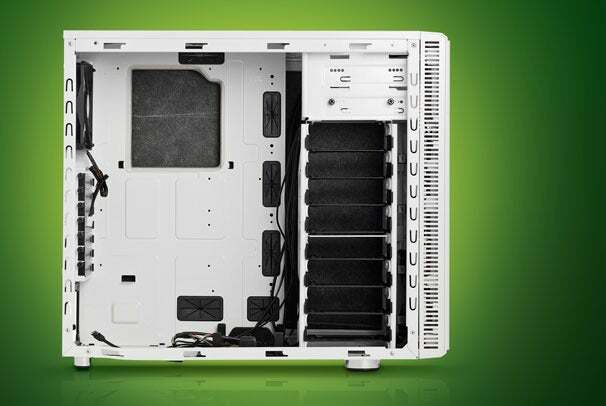 You can find cheaper cases, but the Define R3 is well worth the investment. At just over 17 inches tall and 8 inches wide, it’s spacious, but not dauntingly so. On the face of the chassis are audio I/O ports, two USB 2.0 ports, and a USB 3.0 port--a nice touch. The internal layout is simple: It has a pair of 5.25-inch drive bays, eight hard-drive bays, and a wide cavity that’s roomy enough for all but the largest graphics cards. Only the dearth of 5.25-inch drive bays might be troublesome, particularly if you’d like to install extra optical drives or a card reader. The design of the internal space is an important but oft-overlooked consideration when shoppers pick a case. The Define R3’s interior dispenses with awkward metal bars, giving you free rein while you’re tinkering. Rubber grommets help to optimize cable management, letting you snake wires out of the way; using them may increase setup time, but you’ll enjoy better airflow and a neater presentation. And seven fan slots are scattered about, prefitted with a noise-dampening filter should you prefer the silent treatment. 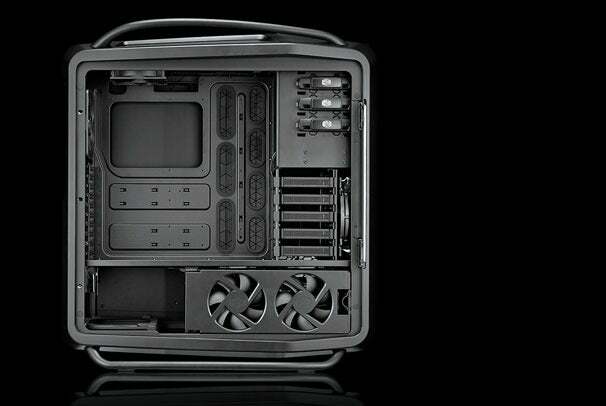 The Cooler Master Cosmos II is unquestionably big. This imposing performance-PC chassis measures just shy of 28 inches tall and 13.5 inches wide, and it weighs a hefty 48 pounds, empty. Easy access to the essential ports around your computer is instrumental on a case this massive, and the Cosmos II does its best to compensate for its girth: A panel on the front provides four USB 2.0 ports, a pair of USB 3.0 ports, an eSATA port, and audio I/O ports. Inside the Cosmos II, you’ll discover three 5.25-inch drive bays, as well as a staggering 13 3.5-inch drive bays--with this case, you will never want for storage. Two of the drives are hot-swappable, and can be locked down with keys. The Cosmos II is a bit busy inside, with fan-lined compartments dividing the chassis into sections to maximize the cooling potential. You’ll still find plenty of room for the largest graphics cards and motherboards money can buy, however, with the included rubber grommets holding wires out of the way and keeping everything neat.